In the indoor garden there is nothing quite like a cloche to really make a plant stand out. There's something about a plant protected by glass that automatically makes it seem special. Lately I've been seeing cloches used more as garden accents with sporadic instances of them actually serving a use in the garden. You can use them to start and protect seedlings or use them to root cuttings. Recently, in the Home & Garden section of a local paper they profiled some wonderful cloches and where they could be purchased by gardeners in Chicago. There were some really nice examples of different shapes and prices. But the frugal gardener inside me can't fathom paying the prices that cloches command at boutique garden centers. I decided to spend a day recently looking in stores near me to see if I could find something I could appropriate as a cloche. I know they can me made out of soda bottles by cutting the bottom out but I was looking for something made of glass. The first and last place I looked was a thrift store near me. There I found a table top clock with a glass cover that looked like a cloche for $2.00- I kept the glass cover and tossed the clock. There were also cheese and cake domes I could have chosen from but they were too short for most of my plants but can easily be used as a cloche. If I want to add a base to it I'll just sit it on top of either a marble or glass candle holder I bought at an import store for $1.00. For a total cost of $3.00 I think it will serve it's purpose in my indoor garden. Heh. I have a BIG cloche that I got for free. My husband is a technician at the chemistry department of Uppsala University, and when they moved they tossed most of the old stuff they didn't need any more. It's a big one, over a feet high and a feet in diameter, so I have a bit of trouble finding the best place and plant for it. And I have to say it; frugal gardening is the best kind there is. Yeah it is the best kind. Oh what I wouldn't give to find a cloche that big. I saw a garden blog recently (maybe a German one?) that had lots of cloches in the front garden. It looked pretty spectacular. Ohhh... a good excuse to go visit the thrifts! 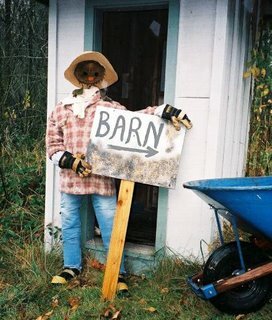 I do keep an eye out for possible garden helpers. I was wondering about various aquarium styles as cloches but the one I've seen was too expensive for that purpose. Makes the plant look like a piece of sculpture. Place it on a pedestal and it definitely would be sculptural. Very nice indeed. You're right those would be great because they're usually much thicker glass. Hi Petunia's Gardener thanks for stopping by. You know I love the thrifts too for gardening finds. I'll post a little greenhouse I found for 80 cents. Thanks for stopping by. I've been to your blog and really like it. That looks really posh, is that a Monadenium under the cloche? I started collecting succulents, so I have a small Euphorbia cap-saintemariensis which would be nice under such a cloche. But I doubt I find tings like that in german thrift-shops. Your blog is interesting, I definetly will come back! Yes it is a Monadenium. I wonderd if anyone would notice it. I just used it for the photo because it is a small plant. Thanks for stopping by. What a great idea! But, I have one question; doesn't the plant need to breathe? 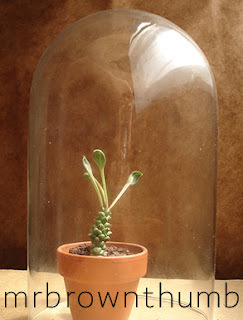 ALso, can glass cloches be used outside, or do they have to be plastic? Yes plants need to breath and if you have a plant under a cloche you ned to occasionally raise the cloche to allow for air to circulate. Some plants like Cacti & Succulents don't do well under glass because they need good air circulation. But other plants like some orchids, ferns and carnivorous plants that are accustomed to higher humidity would appreciate it. You can use glass outdoors, but if you're worried about something happening to it like being broken or stolen go with the plastic that you can easily replace. I have a huge cloche made from....ahem...a 5 gallon water bottle! Just like you describe using a pop bottle- same idea, the nice thing is the water bottle is heavier.